The location of our picnic spot along the Mizzy Lake Trail in Algonquin Park, happened to be very ideal next to a pond where we were rewarded with the pleasure of observing this Atlantis Fritillary Butterfly (Speyeria atlantis). The little body of water lay just off the main Mizzy Lake Trail a short distance beyond Wolf Howl Pond, and most hikers, seeing that we were occupying the spot, just marched along the woodland trail in the direction of March Hare Lake. We were left to the sounds of the birds and the wind in the trees. The still surface of the pond was disturbed only by the occasional dragonfly as it dipped its body in an effort to cool off. Judging by the number of frogs around the edge of the pond, it was surprising that none of the dragonflies got snatched from the air in passing. Atlantis Fritillary comes by its name from the fabled island of Atlantis, and it is considered the most boreal of the three large, orange-dappled fritillary butterflies. There is some variance in the colour of Atlantis Fritillary butterflies with the top sides of their wings ranging from dark orange, to lighter yellow to yellowish orange. A complex pattern of black spots, bars, and chevrons accentuates the orange uppersides, with a solid black margin on both the forewings and hind wings. Males have black veins on the forewings, as well. These butterflies are sometimes referred to as Mountain Silver-spots in relation to the coloured scales on the undersides of their hind wings. Rather than orange, the undersides of the wings are light brown with silvery-white spots. 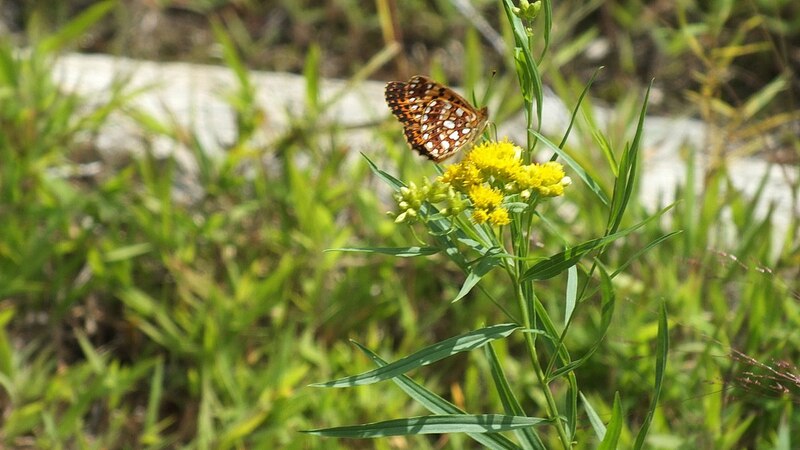 The Grass-leaved Goldenrod (Euthamia graminifolia) was a magnet for the butterfly. 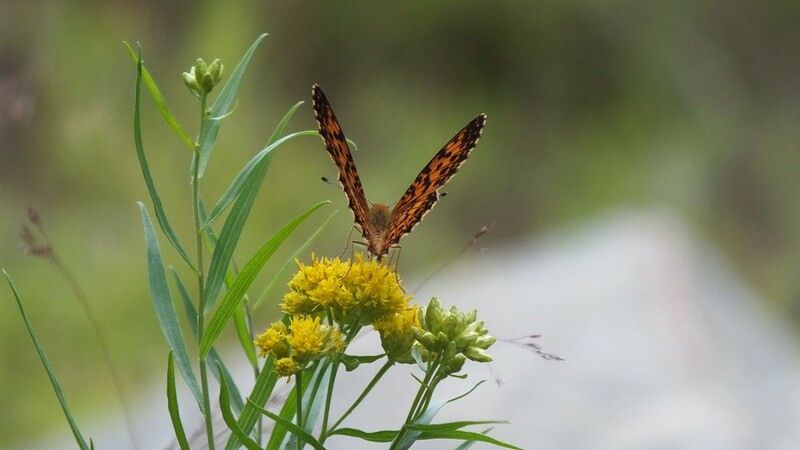 As we circled the fritillary, it repeatedly took flight but returned with determination to the same flat-topped flower that is a favorite amongst butterflies and praying mantises. The wingspan of an Atlantis fritillary butterfly ranges from 2.0-2.5 inches (5-6 cm). 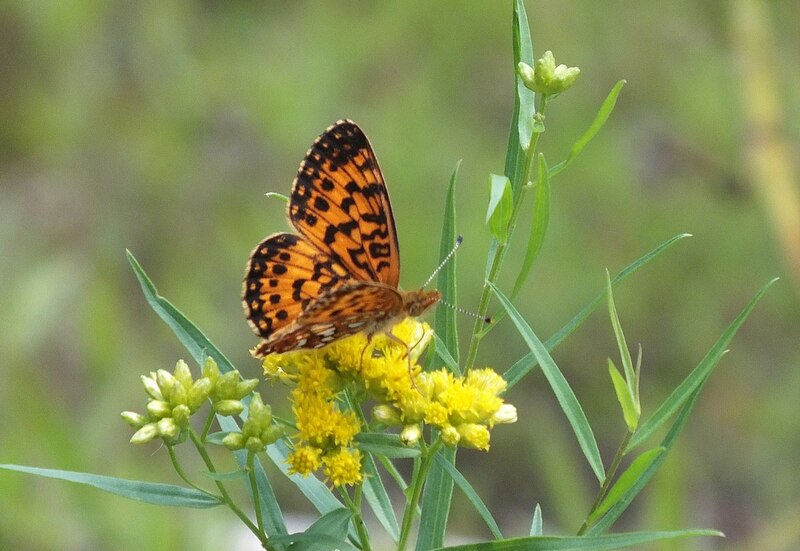 As this Fritillary was nectaring, we were able to differentiate it from both the Aphrodite and Great Spangled Fritillary Butterflies because of the solid black wing margins. 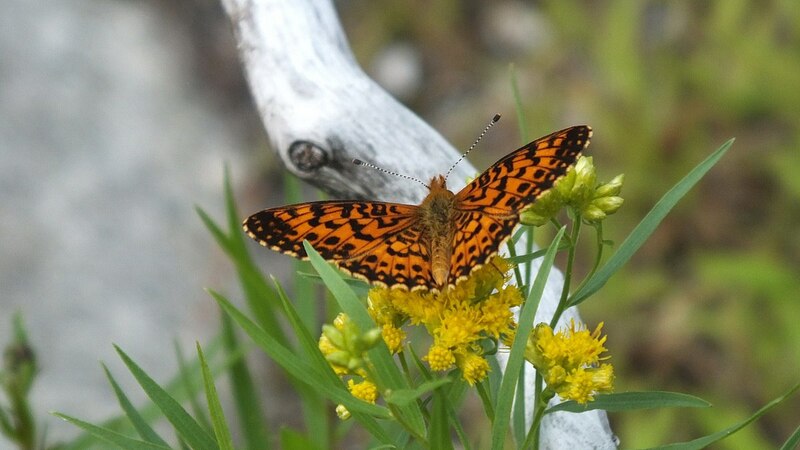 Atlantis Fritillary Butterflies prefer open woodland habitat, woodland trails or roadsides, but they are most common in boreal habitats. 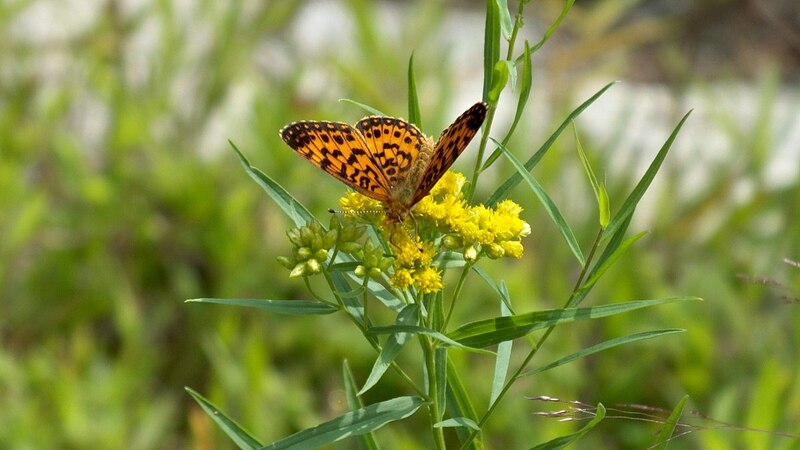 They regularly visit flowers such as milkweed, mint, crown vetch, burdock and spiraea, to name a few. 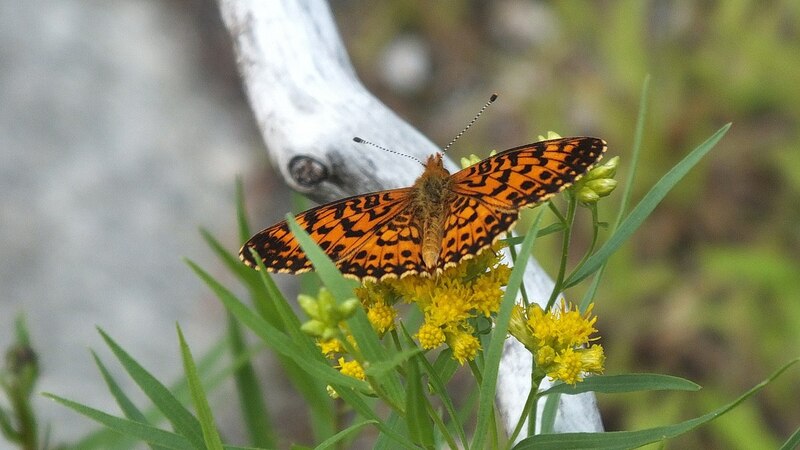 From the Avalon Peninsula of Newfoundland, across Labrador and Quebec north to the eastern edge of Hudson Bay, Atlantis Fritillary Butterflies can be found, as well as across the Prairies to northern British Columbia. Do not expect to see them in southwestern Ontario. An Atlantis fritillary butterfly lays its eggs on Violets (Viola reichenbachiana) or leaf litter near the host plants in the summer, and when the eggs hatch, they spend the winter as small larvae (first-stage caterpillars). Once warm weather returns in the spring, the larvae feed on the leaves of the Violets then pupate over a 2-3 week period. 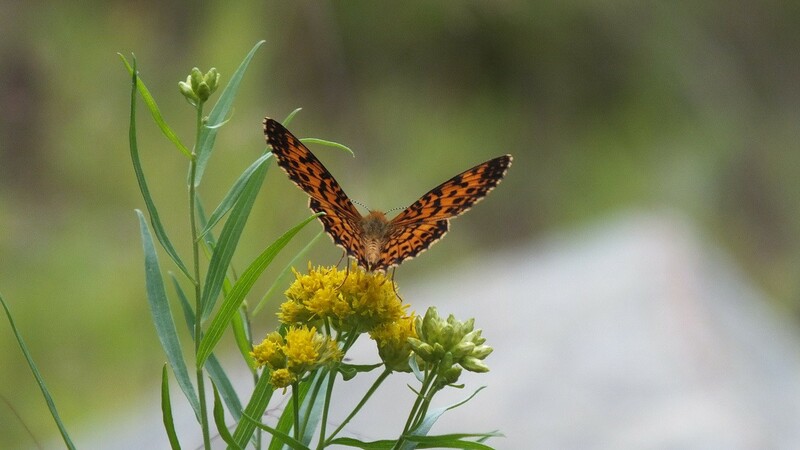 Atlantis Fritillary Butterflies fly from late June through early September although that can vary depending on latitude and elevation. Bob and I felt very lucky to see such a beautiful, intricately-patterned butterfly. They are almost always found within or close to Aspen or moist evergreen forests which pretty much describes the area through which we were hiking. The Atlantis Fritillary was the highlight of our midday break. Your website and photos as well as the background for the Atlantis Fritillary was enjoyable to read. However, the butterfly you photographed is actually a Silver-Bordered Fritillary. In my travels it is actually less common to spot but still a wonderful find. Hi Allan. 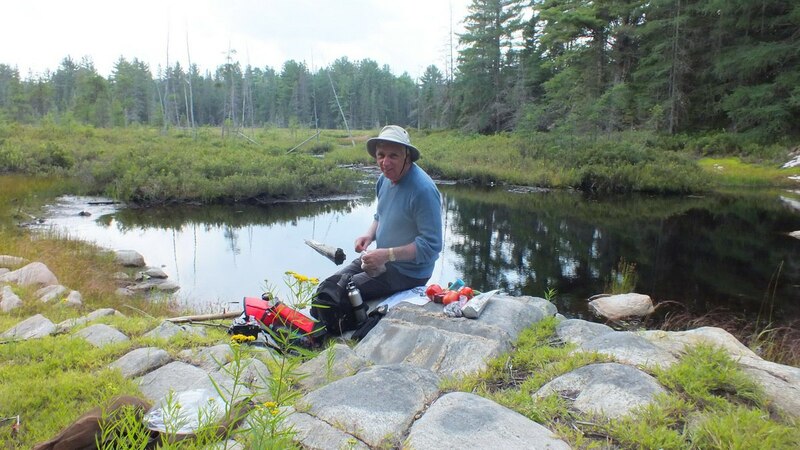 I am glad you enjoyed reading our blog about the Atlantis Fritillary, and thank you for your input. We are not experts when it comes to identifying butterflies…or many other species of insects, for that matter. Even birds challenge us some of the time. It is always exciting to find something new, and a Silver-bordered Fritillary certainly would be a different species to add to our list of those seen. In due course, the correction will be reflected in our blog post, but in the meantime, let your comment stand to notify readers of the correct id.